Show your intense love by sending this Combo Delight of Mouth-Watering Food Items to the dearest people in your life and make them feel special. 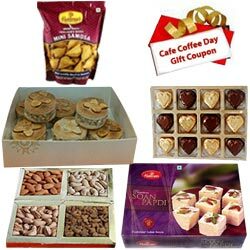 This combo delight is accompanied with 100 gms Assorted Dry Fruits, 250 gms Haldiram Soan Papdi, 250 gms Haldiram Badam Baked Basket, 200 gms Haldiram Mini Samosa, 12 Pcs Homemade Assorted Chocolates and Rs. 500 Cafe Coffee Day Gift Voucher.